If you run a business, and you’re looking for quality landscape design on Long Island, there’s a lot you need to consider. You want a quality job done professionally by a reliable company that’s there when you need them. You also want to take care of your bottom line. Your landscaping service can’t cut too much into your profit margin. For reliability and a fair price, L.I. Elite Lawncare will fit all your needs. We’ll make sure your grounds look as professional as any business on Long Island without charging you Fortune 500 fees. We’ll do the basics: cutting the grass, weed whacking and edging the borders, beds and blow debris off the entire property. We’ll handle any landscape design to give your business a fresh new look, to increase your profits. Got a big parking lot? No problem! We’ll clear it for you in the winter months and make sure your business keeps running smoothly. L.I. 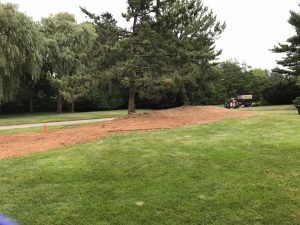 Elite Lawncare is capable of handling any commercial landscaping, lawn maintenance or land clearing you need and we can do sod installation. If your business has a landscape design or masonry project you need to be done, talk to us. We can also customize our weekly landscaping packages to fit your needs. If the grounds of your business is periodically inspected by a corporate parent company, let us know when that’s happening. We’ll get the property in shape so you don’t have to worry. Our employees will behave professionally when they’re on your company’s grounds. They’ll always be dressed in clothing that has our logo visible. L.I. Elite Lawncare offers some of the most competitive commercial lawn care pricing on Long Island. Give your customers a great first impression by presenting them with a professionally landscaped property upon arrival. We can make a difference for your business and increase your profits. Contact us today!